Two days of Wimbledon 2012 are in the books. We're still in the first round, but there's already been a fair bit of drama, upsets and sparkling tennis at the All England Club in SW19. Here are Blacklabel Tennis' 3 thoughts from Day 2 at Wimbledon. 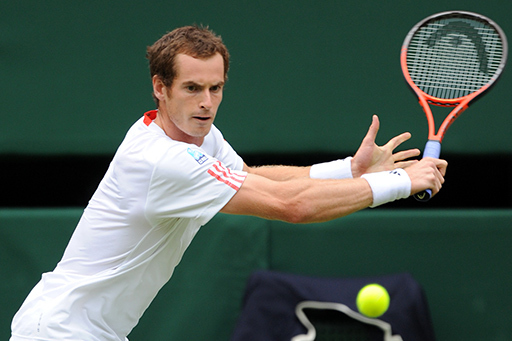 Off To A Flyer: Andy Murray's best record at any of the four majors is at Wimbledon. Coming in a sparkling 24-6 with three consecutive semifinals to his name, Murray is much less an underachiever at his home major than some *cough*the British tabloids*cough* would claim. It seems the Brits, like we Americans, aren't keen to dole out too much credit to one of their own, until (unless) they pick up major tourney hardware. Three times the World No. 4 has seen his Wimbledon end in the same fashion, a loss to Rafael Nadal. The Spaniard ousted Murray from his home major in 2008, 2010 and again, last year. Indeed, if Murray hopes to hoist the Wimbledon trophy, his road is scheduled to go through Nadal once again. Another frequent Murray foe is Nikolay Davydenko. Unlike Nadal, whom Murray seems to find in his half of the draw every time a major is played, Davydenko hasn't crossed paths with the almost great Scot in nearly three years. Davydenko had two strikes against him coming to the court today, he had a negative career head-to-head with Murray and he had told the press in essence, that Murray regularly played possum with his opponents. "We just laugh," Davydenko said to the Sun. "Sometimes he walks on court, he looks tired, like he doesn't want to run anymore, and then he runs like an animal." Judging by Murray's form in his first rounder against Davydenko earlier today showed that Murray took neither the comments, nor his Wimbledon prep lightly. In a performance his coach Ivan Lendl could be proud of, Murray demolished the ex World No. 3 in just 95 minutes 6-1, 6-1, 6-4. Using his celebrated variety to keep Davydenko off balance, Murray's scoreline included ten aces and winning 83% of his first serve points. Yeah, he was that good today. If Murray makes a habit of playing that well when he has something to prove, well then, maybe the British press know exactly what they're doing. Even during a tournament played at the Cathedral of Tennis, stories that have little to nothing to do with the actual tournament being played take wing. For instance, today, a story about the next tournament to be played at the All England Club brought the grapevine to a fever pitch, specifically, Sania Mirza's scathing open letter to fellow Indian player Leander Paes and his meddling father. In a nutshell, Paes, the World's No. 7 doubles player wanted (and felt entitled to) play doubles at the Olympic Games with either Mahesh Bhupathi or Rohan Bopanna. Paes/Bhupathi was one of the best doubles team of the prior decade, but split among significant acrimony in 2006. Despite a few attempts at rapprochement, Paes now plays his ATP doubles with Czech Radek Stepanek, the current Australian Open champions, they are the No. 3 ranked doubles team in the world and Paes individually is the highest ranked Indian man in doubles. Bhupathi currently partners Bopanna regularly. Bopanna ended his groundbreaking partnership with Pakistani Aisam Ul-Haq Qureshi this year to target the Olympics with Bhupathi. Bopanna and Bhupathi are the ATP No. 7 team, and India's No. 2 and 3 men in doubles. Paes petitioned his national federation in essence to force either Bhupathi or Bopanna to play with him. In his mind this would have given Paes and theoretically India, the best chance at an Olympic medal. After a fair-bit of hand-wringing Bhupathi/Bopanna were selected instead and Paes was paired with Vishnu Vardhan, ATP No. 209 in doubles. Aggrieved by the change, Paes' father called on the AITA (Asian Indian Tennis Association) to put in writing a commitment to have Sania Mirza, India's top woman, play mixed doubles at the London Games with his son or else...Else, Paes would pull out of the Olympic team in both disciplines...as the world turns indeed. In any event, Mirza, a bit of a lightning rod in the Indian media for her outspokenness already, fired off an open letter in which she accused the AITA of using her to ensure Paes participation on the Olympic team, even though she too, had planned to play doubles (mixed, in her case) with Bhupathi at the Games. Mirza and Bhupathi just won Roland Garros together. "As an Indian woman belonging to the 21st century," Mirza said, "what I find disillusioning is the humiliating manner in which I was put up as a bait to try and pacify one of the disgruntled stalwarts of Indian tennis." She also slammed Paes, his father and Bhupathi in the missive while praising Vishnu Vardhan, her mixed doubles partner in the 2010 Asian Games, with whom Paes refused to play men's doubles, unless he could secure Mirza in the mixed. Our take, we 100% agree with Mirza, who is happy to play for her country with whomever, but also, oh, how we would love to be a fly on the wall at the team dinner in London. David & Goliaths - Tennis player from Liege, Belgium takes out a seed in the first round of a second consecutive major. 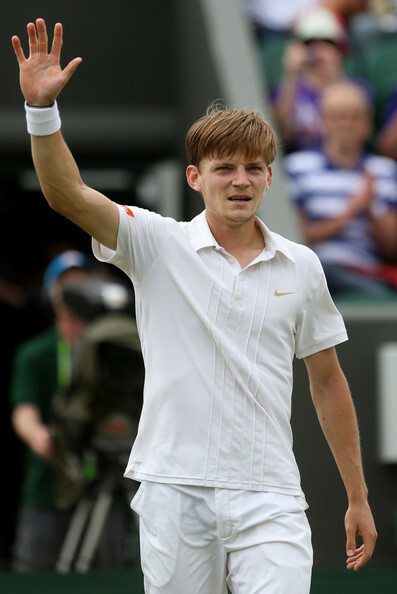 No, we're not channeling the beginning of the Justine Henin epoch, but instead what may become the David Goffin era. We've been talking next big things for a while and on the men's tour, the Big Four's towering accomplishments seem to have crowded out growth potential for anyone else on the forest floor. 21 year old David Goffin doesn't seem to have those hang ups yet, today he moved into the second round of the tournament taking down an even younger player, but more highly acclaimed player in 20th seed Bernard Tomic. The young Aussie electrified his fans getting all the way to the quarterfinals of Wimbledon a year ago. In 2011, there was no such luck and Goffin was the reason why. Goffin posted a 3-6, 6-3, 6-4, 6-4 victory over Tomic in a little over two and half hours. The 5'11" Goffin out-aced the 6'5" Aussie 11-5 and matched Tomic's top service speed. More importantly, Goffin, as the cliche goes, played the big points better. There were a handful of long 8+ minute games, those were won by Goffin usually by getting to one more ball and flicking winners past the outstretched arm of Tomic. The margins were slim, Goffin only winning five more points in the match than Tomic, but he moved on decisively to the 2nd round and inherits Tomic's No. 20 seedline. Tomic seems to be sinking to the challenge to defend his exalted position, after a strong start in Australia, losing to Federer in the R16 there, Tomic is just 13-13 everywhere else. His loss today will cost him nearly a third of his points and should see the 28th ranked Tomic plummet out of the top 40 (commensurate with his results of late). Goffin, on the other hand is No. 70 and rising. His points for just reaching the second round here will probably push him to a new career high (he peaked at No. 64 two weeks earlier) and his 2nd round opponent will be American lefty Jesse Levine, who qualified for the event. Goffin has a long way to go before he's likely to be in the conversation in the second week of a major, but we like what we've seen from the Liege-ineer thus far...oh, we quite like it. Making the most of a big reputation intended for perfection in addition to model which often not any added opposition will be able to gain, fake hublot may take along having per se singular variance still needs a aware personal investment decision. Said definitely not, nothing fake rolex for sale doing a really work in addition to simply just leads to lavish vain. Prior to plunging in almost any work in addition to positioning decrease ones fake rolex for sale, it’s particularly proposed you performed hire satisfactory health care to ensure the unique piece that’s anything you probably display with your currently being. However you will discover many people who definitely are keen on buying the louis vuitton replica handbags. Extravagance merchandise will not be very affordable intended for the vast majority of omega replica watches, so many people please the need to have having more cost-effective these reproductions. Most of these these reproductions usually are being first models quantities of cash on a yearly basis.